It is recommended that you occasionally save changes made to the business plan. To do this, you should click "Save". One may ask: What is the difference between clicking the "OK" button and the "Save" procedure? Clicking on the "OK" button stores the input and results in a recalculation of the financial engine, but to change the business plan in the server's database, and to make the changes visible to other project team members, click "Save." Save Changes to the business plan are saved in the server's database. Also the changes made by one user become visible to others. Reload Users can work on the most recently recorded data (saved version of the business plan). This means that changes saved by other users will appear as well. NB! Action "Reload" means that you will return to the most recently saved version and changes that were not saved, will disappear. Save as.. With this function you can save a copy of the project under a new name. This feature is available for the workspace administrators. Click on the project name (the link at the top left area of the worksheet). Then select "Save as..". It is possible to save a copy with your project team, or without. It is also possible to save only structures (chapters, titles for revenues and expenses). - The user who has made changes, clicks "Save." - Others can see these changes when they click "Reload." 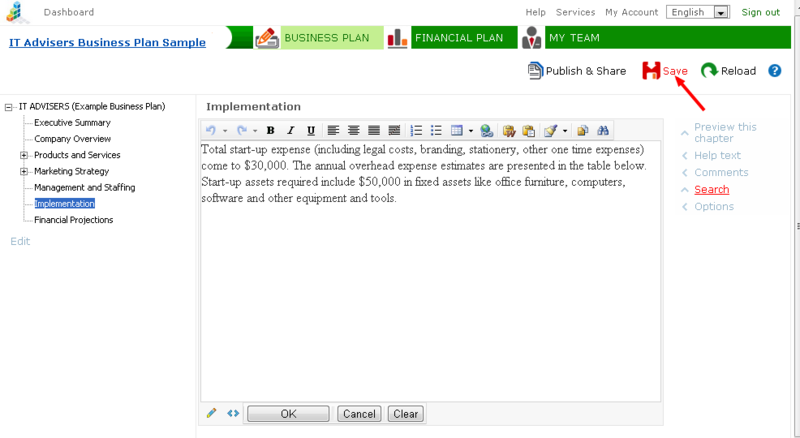 "Save" and "Reload" functions are relevant only in the "Business Plan" and "Financial Plan" sections. Changes in "Performance" and "My team" sections are saved in the database immediately after clicking the "OK" button.